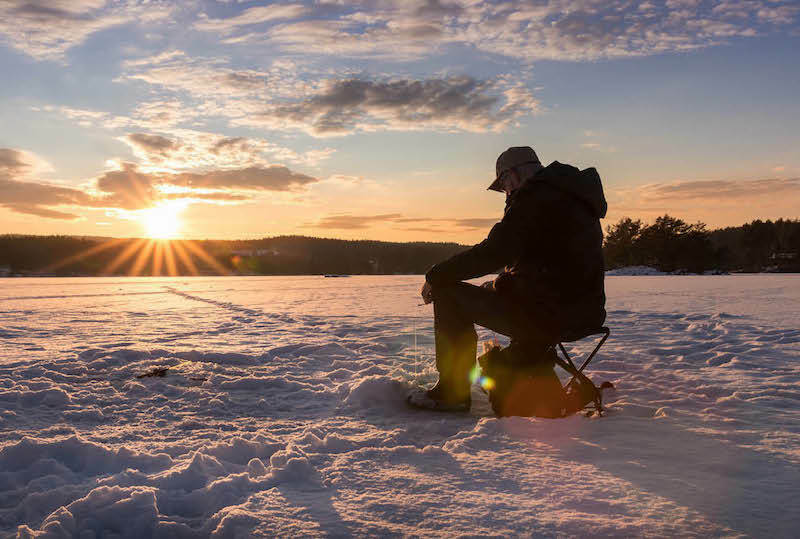 Once you have bundled up and made it out to your lake or river of choice, it’s time to determine where on the ice to set up. Before you get settled and drop your lines, make sure to thoroughly check the ice thickness around you to ensure it’s a safe location. Generally, if you can find the fish, you can catch them. Many people use fish finder technology to determine where the fish are below the ice. Most electronic depth finders can be used above the ice without making a hole. Simply hold the transducer tightly to the ice and shoot directly down. You should be able to see structures and groups of fish as marks on the depth finder. Most likely you will find a school of fish here and a school of fish there, so remember to mark the spots as you go, as you may want to create multiple holes. Many fish will stick close to the same places in the winter as they do in the other seasons. Weed lines, structures, or coastline breaks are good places to look. Fish like areas where the mouth of a small bay or stream joins a larger lake, especially if the depth changes drastically. Look to these areas for concentrations of fish. In the winter, fish tend to swim horizontally at one depth. If you think you are in a good area, but are not getting a bite, change the depth at which you are presenting your bait, the fish may be resting higher or lower and not see it. In the winter, some fish species will cluster together. Since fish do not move as fast in the winter months, they are more vulnerable to predators. They tend to group together for protection. Where you find one, you will most likely find more. Because they do school, if you haven’t had a bite in 20 minutes, move to a new location.